Our wrought iron doors are designed to offer you a great combination of strength and style, providing an old-fashioned look and feel. They are available in a variety of styles that you can see near Mandeville or New Orleans in our two locations. Conveniently, you can visit our stores on the Northshore or Southshore of Lake Pontchartrain. If you are not familiar with wrought iron, it has less carbon than cast iron. Thus, the iron alloy has an appearance of grain, much like you would see in wood. It is easy to work with due to its malleability, but it is still tough. Sometimes people think of the mid-to-late 1800s when they picture wrought iron, as this is when it peaked in popularity. Perhaps the most famous use of wrought iron is in the Eiffel tower in Paris. Historically, wrought iron was made by hand, but sometimes it is now made out of a mild steel and done automatically. There are more than 130 options available in our wrought iron doors, so you have quite a few options to choose from. First you’ll have to decide whether you want your door to be primarily wrought iron with other accents, a split mixture between wrought iron and wood or glass, or primarily wood or glass with a little bit of wrought iron accenting. Either way you will be getting a unique look that will really make your house stand out from your neighbors in New Orleans or Mandeville. Doors that are made primarily of wrought iron will either be outer doors that have open air in spaces, with a second interior door to offer a complete seal or they will be combined with other materials. Glass and wood are the two main options, which enable you to have a single door with a primarily wrought iron appearance with other materials giving some contrast in color and material. These doors typically have outer areas made of solid wrought iron, and inner areas, which are ornately shaped bars. In between will be the wood or glass. As you shift toward styles that are made primarily of wood, you will tend to see that the pane or panes of glass set into the wood have wrought iron bars in them in various designs. They may be in intricately crafted loops or curves, or in squares, rectangles and triangles. This gives you a wide variety of looks that can suit your style and your taste in materials, ranging from a simpler look that might fit better with the old-world style of traditional wrought iron doors to the more intricate, interwoven designs that provide a different, fresher style. As you can see, there are a lot of different styles to choose from as you select a wrought iron door. If you don’t know exactly what your preference in a wrought iron door is coming into your purchasing process, the best way to move forward is to come into a store and see a few in person. You can do this on either the Northshore or the Southshore of Lake Pontchartrain, with locations in Mandeville and New Orleans. 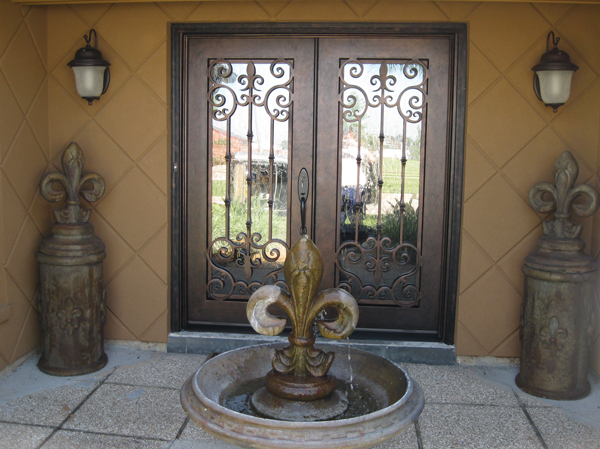 In fact, even if you do not like any of the available options for wrought iron doors, at Doors of Elegance you can select from custom styles and designs so that you can find something that suits your taste perfectly. Remember, you only get one first impression and when it comes to your house, your front door is more or less the first impression people will get.